Home // C.O.R.N. Newsletter // 2017-31 // Should we add Diaporthe stem canker and Cercospora leaf blight to our list of disease ratings for Ohio in 2018? Should we add Diaporthe stem canker and Cercospora leaf blight to our list of disease ratings for Ohio in 2018? Improving soybean yields in 2018 begins first with the selection of the cultivars that have the best resistance package for Ohio’s notorious pathogens and pests. Any grower that’s slacked off on the Phytophthora package gets a quick reminder of the damage that this pathogen can continually cause in a vast majority of Ohio’s production regions. Same thing with soybean cyst nematode; while the symptoms may not be present, planting a susceptible variety and getting half the yield that the neighbors got leaves some farmers scratching their heads. We finally have resistance to Sclerotinia that is effective for those regions that deal with it on an annual basis. Over the past decade, we’ve added frog eye leaf spot to that list as it can overwinter and if infections get started at flowering it can cause substantial damage. Why put another $30+/Acre for a fungicide to control frogeye or Sclerotinia when the cultivar resistance can hold that disease in check? Now it may be time to begin to think about some additions to this list as in the past 3 years, I’ve been called to fields that have been severely affected by some pathogens that are typically rare in this part of the U.S. Diaporthe Stem Canker and Cercospora Leaf Blight (Figures 1 and 2). Let’s take each of these separately and explain a bit more. The symptoms that are occurring in Ohio this year are large patches of early dying plants that still have their leaves attached. The canker is not as well defined but can occur from the third node at the bottom of the plant up to the top 1/3. There may be rows of small pin dots in the center of the canker or on pods that are the actual fungus. The bottom two nodes of the plant are still green – which can separate it from Phytophthora. If the stem is bleached white and has white mold – it is Sclerotinia. For Diaporthe, the internal tissue – both the pith and the stem are degraded. Diaporthe is caused by several different fungi and can also lead to Phomopsis seed rot. The fungus survives very well on residue. And in fact the most affected fields that I have walked in 2017 – were in fields where the disease may have occurred to a smaller extent the previous year. Diaporthe also infects a number of weed hosts that can also contribute to the survival in fields including: black nightshade, morning glory, northern joint vetch, and spiny amaranth are a few and most do not show symptoms. Infections for this disease occur in the early vegetative growth stages of the plant and these are favored by long periods of warm (72 to 86F) wet weather. Rain splash of spores from plant residue can facilitate these infections. Does this sound like our summer where some areas had 15” or more during June-July? This fungus takes its time, and the symptoms tend to coincide when the seeds begin to fill in the pods. Management is highly successful with two tactics, planting resistant cultivars and reducing inoculum. The screening for resistance to this pathogen is fairly straightforward for Diaporthe, so most companies should be doing this. Tillage and rotation both are effective in reducing inoculum. A study in Georgia reported in 1988 indicated that a soybean-wheat double crop was not as effective as a soybean-fallow rotation. Another foliar and seed pathogen that is not well known in Ohio and is much more prevalent in the Southern US. The reddish discoloration and leathery appearance begins to appear on the top leaves as the plants begin to fill out the seeds. Purple lesions on the petioles or stems also develop. The infected petioles remain attached to the plants while the infected leaves fall off the plants. Warm temperatures and frequent rains also contribute to this disease which can be spread by rain and wind. This can also be residue born – so for farmers that have this in their fields in 2017 – TAKE NOTE- residue management and planting varieties with resistance will be essential in 2018. Infections for Cercospora can begin at flowering and repeat throughout the season, but symptoms do not develop until pod fill. 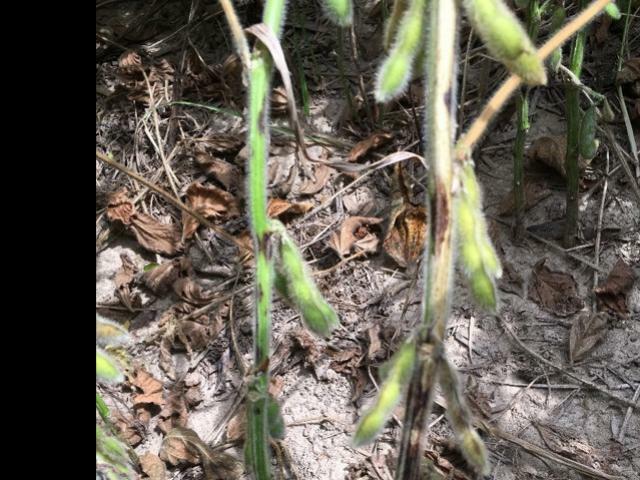 Seed can also become infected and develop the same purplish-red coloration and contribute secondary losses if they are food grade soybeans. The pathogen that causes Cercospora leaf blight and Purple seed stain produces a light-activated plant toxin, which contributes to the purple discoloration of the diseased tissue. Spores are produced on the residue or infected tissue and are dispersed by wind or rain onto nearby soybean plants. Only susceptible varieties will develop symptoms and these will be more pronounced when dry, warm conditions occur at pod fill. Disease management strategies include planting high-quality disease free seed, tillage to break down infested residue and crop rotation to prevent inoculum build-up, and planting resistant varieties. For fields that are affected in 2017 – a timely harvest to ensure the fewest number of seeds develop purple seed stain. Secondly, for fields in 2018 that go back into soybean, if susceptible varieties are planted, a fungicide application of a triazole at R3 may provide some protection. However, infections can occur during the vegetative phase and most of the data to date is from the southern states with determinant later maturity groups. This is a big hole in our data set for providing recommendations for fungicide timing for Cercospora blight in northern areas. The bottom line, when you are at Farm Science Review this week talking with the seed companies, ask for the resistance packages on the varieties. Yes, yields are important – but the resistance and savings in additional mid-season inputs is key to profits in years with narrow margins. The risk for disease development continues to increase with mild winters that favor overwintering and the soil-saturating rains that seem to occur weekly. These conditions make those resistance scores more and more important each year.